"Nothing acquires quite as rapid or peculiar a patina of age as an imaginary future." - William Gibson, Burning Chrome. "Patina" is an interesting word to choose. It can refer to a desirable, well worn and aged look, and also the ugly greenish corrosion on coins. And so, too, a patina's aesthetic effect on sci-fi is one entirely of context. Science fiction's slick veneer of prescience breaks down almost immediately, corroded by the passing of time and our better informed perspective. If this happens so quickly and consistently, why does sci-fi maintain its appeal, especially old sci-fi, which ends up inaccurate and outdated? Well, science fiction is not, and traditionally hasn't been, about the future, science or technology. It's about us. Now. In the Ottawa Citizen, Canadian sci-fi author Robert J. Sawyer (Rollback, Mindscan) reminded us that in War of the Worlds even H.G. Wells, a pioneer of the genre, was speaking not about technology, not about the future, but about his society in his day. It wasn't ever about a Martian invasion. That was just the context for the story he needed to tell. "It was Wells' attempt, using the unique tools of science fiction, to get his countrymen to see what it's like to have one's culture crushed underfoot by an uncaring, expansionist, technologically advanced foreign power. He'd hoped they'd realize the cruelty of what Britain was doing in India and other places." But it's unlikely that every single science fiction writer sets out with the same purpose. A writer could try to pen unambiguous speculation about what the future might bring with no intentional allegories or subtext. But, eventually, her story becomes one of the future seen through the naive lens of the past. Over time it's inevitable that, whatever her initial goal, the story will be an artifact of the time in which it was written, and a comment on that time and its way of thinking, indistinguishable from reflections on the here and now. 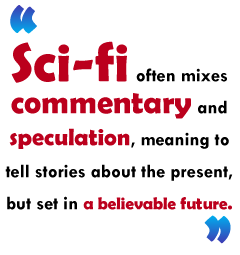 Sci-fi often mixes commentary and speculation, meaning to tell stories about the present, but set in a believable future. Star Trek's content, for instance, told stories about its own time, but its context was speculation about the future of technology. You can easily see, though, even that was just a redressing of the present. In his July 2007 article in Locus Magazine, sci-fi author Cory Doctorow suggests that the "non-futurismic version of NCC-1701 [the Enterprise] would be the size of a softball" and wouldn't need an onboard crew. Its transporter would store multiple copies of the most competent crew member, "no redshirts, just a half-dozen instances of Kirk operating in clonal harmony." Even the idea of a human away-team at all seems a little quaint to me. But ships with large crews are what we have now, so that's what Star Trek said we'll have then.